This version of Project Manager focuses on working with Proxy. Proxy with materials – each type of proxy is now saved with the corresponding library of materials. Now a more intelligent method of determining Pivot is used when converting a model that consists of several objects into a proxy. Pivot will be assigned from pivot of top group (if it exists) or taken from one the existing pivots which be the nearest to original point ( [0,0,0] ). So, in most cases, it will allow to assign the pivot to the most relevant, smart and accurate method. A new API method is also added – MakeProxyFromFile. See the related example in the file “AddToForest.ms” in the “presets” directory. A problem with the API method “ConvertToProxy” is fixed. I want to draw your attention to the script “AddToForest.ms“. This script demonstrates the possibility of using the API to write your own extensions for the Project Manager. 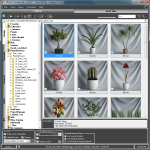 With it, you can add objects to Itoo Forest right from the Project Manager interface. Create and set up Itoo Forest, then select the files in the Project Manager and apply them to Itoo Forest. Watch a video demonstrating how to use the extension “AddToForest.ms”. Note that the example scripts in the “presets” folder are provided only to demonstrate the API features and are not full extensions. Use them to study the API features and create your extensions for your specific needs. 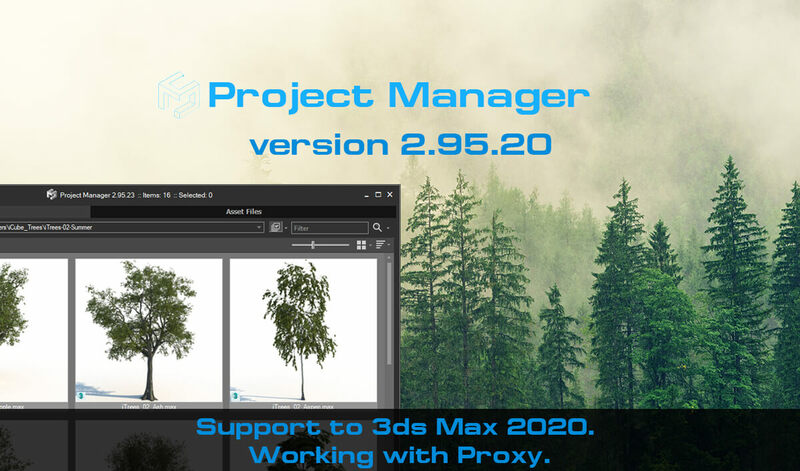 Related to "Project Manager version 2.95.20"
I have a problem because I previously installed 2.95.03 into Max 2020. Project Manager actually worked for 2020 with that version, but now there are pop-ups every time I launch 2020 about updating/installing PM. This continued even after running the uninstall for that version; it continues still after installing 2.95.20 … it keeps prompting to install updates for 2.95.03. What can I do to get PM to know that the latest version is already installed and get rid of the prompts at startup? 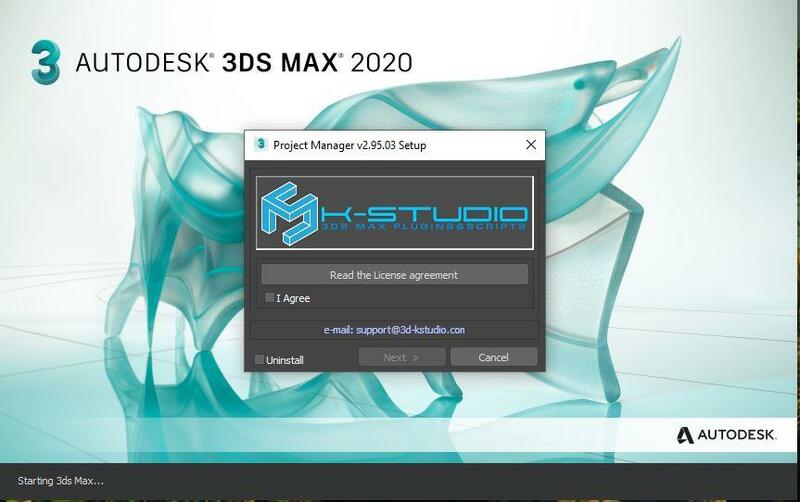 I presume there is some cache I can delete but I’ve already tried removing all files for PM I know of in the 3ds Max AppData. This looks like plugin didn’t update the file “Version.ini”. Please check if this file can be accessed for writing. If I hit cancel, the same popup will come back. If I hit cancel again, then Max goes ahead an loads and PM will work with correct version. However, if I don’t hit cancel but instead hit Agree and Next, it installs the older version over the new one. Note I previously ran the uninstaller and deleted the files in userScripts/TrackScripts/ before installing the latest version. As always, thank you for the attention. Please check if ProjectManager.mzp is located in scripts startup or stdscripts directory. I could not find it in any Max or APPDATA path. I had used Run Script … and the MZP is on my desktop. As I see the problem is that the MZP file (or the unpacked MZP archive with the mzp.run file) is in one from 3ds max’s startup folders. Please check your skype’s messages. Thanks for the great support Alexander. Taking the time to help solve my issue (which turned out to being caused by my own mistake in copying some files) helps to show off your dedication to your customers. Thank you!